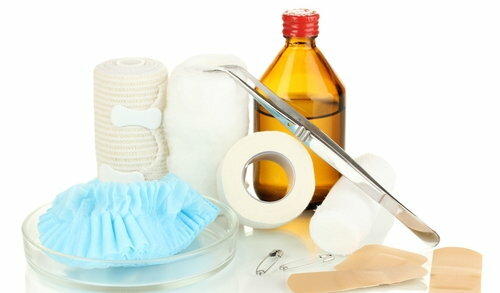 Applying first aid as initial medical care to a wound or an injury temporarily until a professional medical care is available can, in many cases, be life saving. However, most wounds or injuries occurring at home, work or school are not life-threatening and no further medical attention is required once first aid is administered. Thermal injuries: Caused by extreme cold or hot objects and surfaces that come into contact with skin, such as boiling water, a hot stove, sunburns or ice. Whether it is a minor skin wound or a major life-threatening injury, all types of wounds should be treated with first aid on site without any delay, as it can save life or limb. First aid can help stop bleeding, prevent infection or poison venom from spreading. Applying first aid immediately can sometimes prevent the need for further expensive medical attention and help the wound to heal with minimal scarring. Thermal wounds: Remove the source of injury. Uncover or remove clothing from the burned area and wash with cool (not cold) water. Alternately, you can apply a cold compress until the pain subsides, then apply clean bandage with or without antibiotic cream. Chemical wounds: Rinse the wound site under running tap water until all the chemical agents are cleared, then apply a clean bandage with or without antibiotic cream. Penetrating skin injuries: Clean the wound with tap water if possible, and apply firm steady pressure if there is any bleeding. Cover the wound with a clean, sterile bandage and try to minimize movement as much as possible until the bleeding stops. Blunt injuries: For lacerations and abrasions, rinse the wound with tap water, then clean it with a disinfectant solution such as diluted iodine. Apply topical antibiotic ointment, and wrap the wound with a clean bandage. If a bone fracture is suspected, try not to move the patient's fractured limb or wound site and call 911 for transport to a hospital for treatment. Bites and stings: Irrigate the wound area with running tap water, and apply a disinfectant solution or topical antibiotic ointment. Cover the wound with a clean bandage and seek medical help or call 911. Make note of the cause of the injury so you can pass this information to the medical care team. Electrical injuries: Disconnect the electricity if possible or move the injured person away from the source of electricity by using an insulated object like a wooden bar, dry blanket, plastic robes or tools with insulated handles. Minor electrical burns can be treated with cool water. You can apply mild antibiotic ointment after cleansing and bandage the wound. For more serious electrical injuries, check the patient for breathing and a heartbeat and apply CPR as needed. Raise any burned arms or legs above the patient's heart level, cover the body with wet cool clothes and call 911. For burns, avoid using cold water, ice, alcohol, butter or other greasy materials or homemade remedies to ease the pain or clean the wound. Don't take a bandage off too early as it can help to heal a wound and keep it clean and moist. A bandage can also prevent a wound from getting infected or stuck to the clothes. Never break a blister or scrape a wound roughly with strong cleaning products. Always keep matches, lighters, hazardous chemicals, hot beverages and pans away from children and out of reach. It is best to use safety latches wherever possible in a home where children are present. Cover any unused electric outlets with safety covers, and replace any damaged, frayed or brittle electrical cords. Keep a small fire extinguisher in your kitchen, and never pour water on a grease fire as it can spread the fire.